First off, while new features in the pipeline are already being worked on with great excitement, Apple's announcement to cease support for 32 bit code (apps as well as all 32 bit audio) forced us to upgrade our AI development environment to a new generation earlier than planned, which was actually scheduled for next year. Since that environment has changed significantly in the past years, this transition came with a horrendous amount of (unpleasant and tedious) work that kept us busy for the most part of this year. So, apart from the enhancements introduced below, there will be no major new features this time. On Windows, the move to 64 bit is less pressing, but in the end we decided to pull the plunge and upgrade that platform too, so there will be no different version numbers to deal with. It is more likely though, that on Windows you will be still able to run extra 32-bit Engines for some time. This window, home of the global rack and audio preferences, was streamlined and simplified for a better overview and ease of use. We flattened the tab hierarchy to a single level, so almost all items are now available with a single click. I never expected this to be a big deal, but it is really making navigation easier. 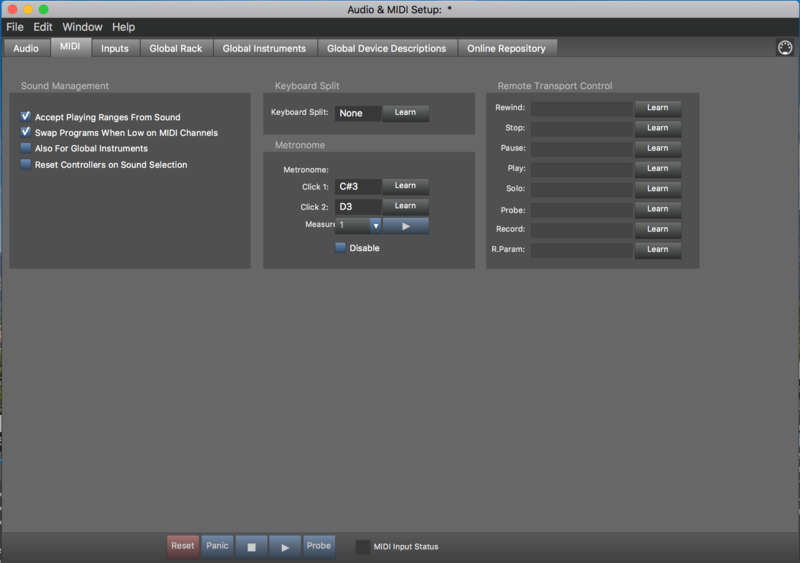 Since QuickTime on the Mac will be a thing of the past soon, and there has never really been a usable GM synth on Windows, we decided to integrate an instance of Soundcase directly with Synfire. This is really only a bare bones GM synth to serve as a fallback for users that don't have AudioUnits or VST plug-ins at hand. It has no user interface and can be enabled or disabled as needed. It is lean and nice and may come in handy for mobile use. We recommend leaving it disabled on Windows, though, unless you can deal with it taking up your ASIO driver, possibly blocking the Audio Engine and/or your DAW from connecting to ASIO too. This is not an issue with Windows Audio, which you should select in that case. On the Mac there are no such conflicts with audio drivers. We summoned all audio settings in one place, where you can now immediately see and change the desired hardware parameters and run a plug-in scan or update of those as well. Our doing away with the convoluted popup dialogs is certainly a welcome simplification. 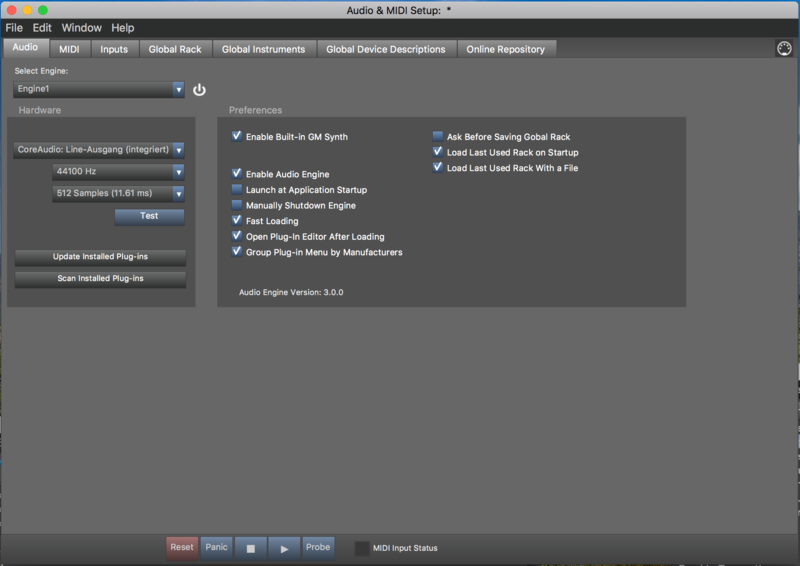 The new "Audio" tab is also where you can launch and shutdown individual engines and the built-in Soundcase synth. So you now have up to 3 processes (64-bit Engine, 32-bit Engine, embedded Soundcase), plus any number of remote Engines (any bitness) in your LAN, that can output sound to hardware, host audio plug-ins and connect to Synfire. You can even mix macOS and Windows computers in your LAN. Eventually however, the next macOS after Mojave will no longer run any 32-bit programs. This means you will not be able to run a 32-bit Engine anymore. Therefore now is a good time to migrate your 32-bit global racks and arrangements to 64 bit at next opportunity. After upgrading macOS next year, this will no longer be possible. Here's some instructions on how to do that. Since almost half of the entire code was affected by the platform upgrade, we advise you to be careful and consider this initial release a beta. Don't update yet, if you are in the middle of a project, or can't otherwise afford to experience crashes or potential data loss. We don't expect major issues, apart from occasional hangs or crashes, but strongly advise to backup your computer and all projects before installing the beta. Save any projects to separate folders, so you don't overwrite them yet. This will make it easier to return to 1.8.5 should that be necessary. Files written by 1.9 can be opened by 1.8.5 only after installing the backwards compatibility patch into 1.8.5 (Help >> Online Updates). It's probably a good idea to install that patch BEFORE you backup your computer and update to 1.9. Some graphics details are already foreshadowing a design update currently in the making. Don't expect anything substantial yet, though. On macOS the minimum requirement is now 10.9. If you run an earlier version of macOS, you can't (and need not) install Synfire 1.9. We are so looking forward to rolling out a new set of features based on this new platform, beginning early next year. As always, the list of changes can be found here (new items will likely be added until the final release). If you want to comment on this toptic, you can do so here.